was destroyed in another fire in 1926. "Located in the extreme western county of the State, Murphy, while not large, is the most important town in this section. It is the seat of Cherokee County and is prosperous and progressive. It is picturesquely situated in the very heart of a mountain region which, as yet, is comparatively undeveloped. It is the western terminus of the Murphy Division of the Southern Railway. The achievement of the task set by the original promoter was overwhelming to the most thoughtless. In the last few years the town has developed rapidly and now is a large distributing point for the rich timber and mineral section which surrounds it. It is the location of several important industrial establishments, chiefly wood-working factories, and is the commercial center of the Southwestern part of the State." "The Southern Railway and the Louisville and Nashville Railroad, both terminating at Murphy, are the principal transportation lines. In addition to these a logging road runs from Andrews across the Snowbird Mountains into Graham county, and a Tennessee lumber company is planning to extend its narrow gauge logging railroad in to the virgin timer of the Tellico River region. The roads are rough, poorly graded, and poorly drained. Several miles of road running out of Andrews have been macadamized, however, and Murphy Township is macadamizing its roads." building. This postcard was postmarked July 18, 1911. "In addition to its importance as a business center and as the location of the county government, it is a favorite resort for many tourists who visit it from time to time to enjoy the wild scenery in the vicinity. Within a few miles of the town the traveler may find places which never have been trodden by Man. The primeval forests nearby yet are awaiting development and the soil is rich in many minerals and in agricultural resources. Several fine roads and good mountain trails lead from the town into the surrounding country. Only two and one-half miles away is Fain’s Knob, a small, bald mountain, from which may be obtained wonderful views of many mountain peaks in the distance, particularly Mt. Enotah, locally known as Brass Town Bald, 4,790 feet high. 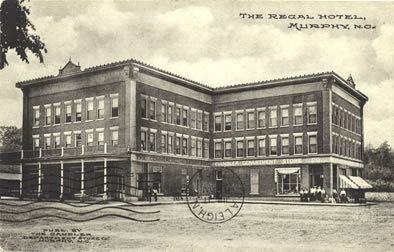 "Crossing the Valley River, a beautiful mountain stream, about a mile from Murphy, the Railway reaches its first stop on this division at Regal, N.C."
The Regal Hotel, built in 1910, also housed the Candler Department Store and the Commercial and Savings Bank. The lettering for these latter two establishments may be seen above the first floor of the building. 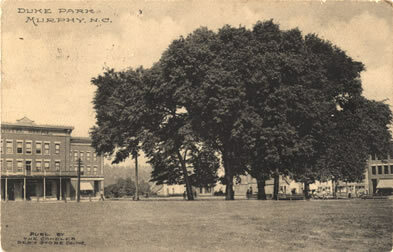 This postcard was dated July 1912. Text excerpted from 1912 travel guide, The Western North Carolina Section at a Glance. Issued by the Passenger Traffic Department, Southern Railway, Premier Carrier of the South, Washington, D.C., 1912. Cherokee County Historical Museum. A Pictorial History of Cherokee County. 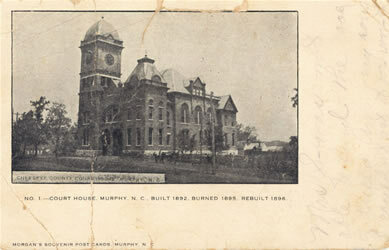 Murphy, N.C.: Cherokee County Historical Museum, 1995. Freel, Margaret Walker. Our Heritage, The People of Cherokee County, North Carolina, 1540 – 1955. Asheville, N.C.: Miller Print. Co., 1956 [c1957]. White, Alice, D., ed., and White, Nell A., associate ed. The Heritage of Cherokee County, North Carolina. Winston-Salem, N.C.: Cherokee County Historical Museum in cooperation with the History Division of Hunter Pub. Co., 1987. Williams, Michael Ann, essay, inventory, and photography; Dockery, Carl, ed. Marble & Log: The History & Architecture of Cherokee County, North Carolina. Murphy, N.C.: Cherokee County Historical Museum Council, Division of Archives and History, North Carolina Department of Cultural Resources, 1984.